The concentrated yet gentle formula of Edelweiss Whitening Serum is specially designed to address dullness and darkening of the skin. Integral of active natural complex; ALPAFLOR© Edelweiss EP, Alpinia White, Achromaxyl and Vitamin B3, refines skin and changes from dull and dark to bright and light skin with natural white radiance. Additional ingredients of Polyglutomic Acid and Schizophyllan make skin soft and supple and so touchable. Directions: Apply serum all over clean face and neck, morning and bedtime. 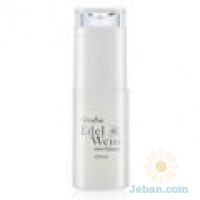 For optimal result, use in combination with other products in Edelweiss Whitening Series.